York Canine Association is the country's oldest established canine association formed nearly 125 years ago. 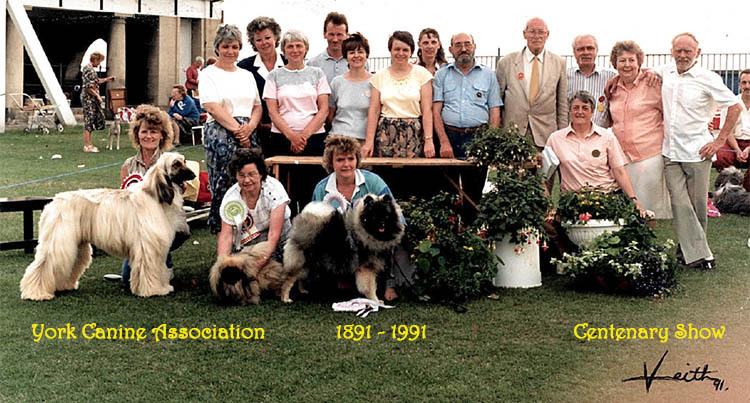 Pictured below are the committee and some of the judges at our Centenary Open show held on 7th July 1991. Best in Show judge was Mrs Di Johnson who gave the award to the Afghan Hound, Brandeswood Harrier with Reserve Best in Show going to the Pekingese, Champion Tomsdor Rules Son of Singlewell. Best Puppy in Show was the Keeshound Calanigo Bertolino.